There is absolutely no place like home! Sanctuary of Hope’s Family Connect – Connect LA program recently helped 22 year-old Michael reunify with a bioligical parent in Denver. After traveling to Los Angeles in pursuit of a dream to advance his life, Michael found himself without housing and employment. The lack of a job and financial resources landed him in a shelter for three months. With the help of a local drop-in center, he remained motivated to get on his feet and was referred to our Family Connect program. The Family Connect- Connect LA team provided Michael with emotional support, encouragement, and life coaching services to assist him with cultivating positive and healthy relationships with his family. After a couple of months of family engagement and learning how to communicate with his mother and father who lived in separate states, the healing and mending process resulted in Michael and his family deciding to reunite. The program assisted with covering transportation and meal expenses for Michael’s return home. It’s amazing what the comfort of family can do to change a young person’s outlook on life. Two weeks into settling in with his family, Michael found employment and has committed to living a healthy lifestyle. Michael remains in communication with staff and shared, “ I am happy to be with my family”. 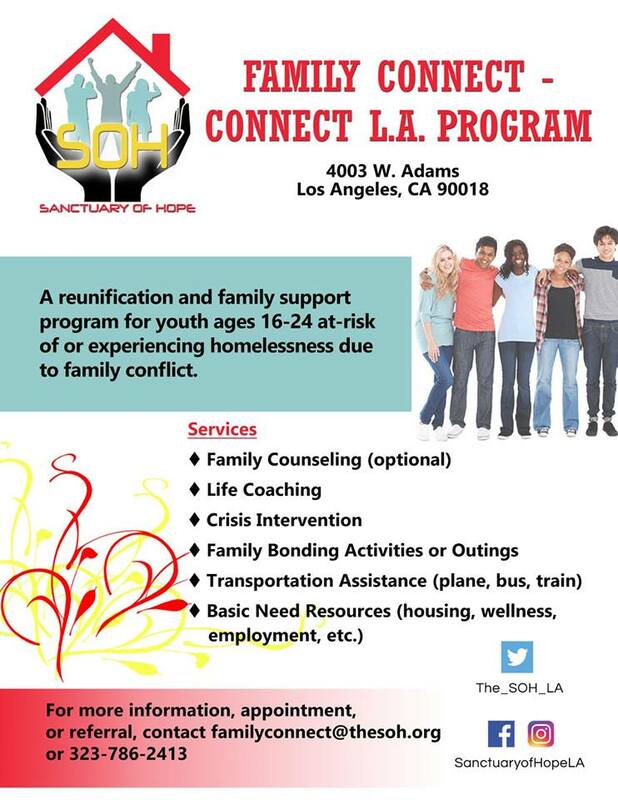 To learn more about our Family Connect – Connect LA program and resources to help homeless or at-risk youth experiencing homelessness due to family conflict, contact Tiana Brown at tiana.brown@thesoh.org.